Humor, it�s what gets me through the day and it�s what keeps me sane. And humor is how I deal with diabetes on a daily basis - I figure if I can laugh at all the crap diabetes brings into my life, I can spend more time owning my diabetes, instead of my diabetes owning me. A few months back, the folks from Colgate Total reached out to me to team up with them in their 30 Days of Laughter campaign. The campaign focuses on diabetes, the importance of good oral health and using humor as a coping mechanism when it comes to living the diabetes life. YEP, my interest was piqued! Look, I know a lot people, diabetes or not, don�t do well when it comes to going to the dentist - I also know that good oral hygiene, a.k.a, taking care of our teeth and gums is especially important to people living with diabetes. t3 ( a person who loves someone with diabetes, regardless of the D type,) Joey Fatone, Colgate Total, and the American Diabetes Association will encourage the DOC (Diabetes Online Community) to participate in �30 Days of Laughter� by using the #30daysofLOL hashtag, to share memes, tweets, statuses pictures, videos and blog posts. MySugr and Colgate Total have created an incredibly cool Monster Selfie app for you to tame your diabetes monster and show off your smile during #30DaysofLOL and beyond! And on Wednesday December 2rd, at 8 pm EST there will be a 1 hour Twitter chat with Colgate (@Colgate) and the American Diabetes Association (@AmDiabetesAssn,) and (hosted by yours truly, @diabetesalish) where diabetes and diabetes humor will take center stage. I hope you�ll use the #30DaysofLOL hashtag and join in the fun! It's how I feel and I made that! Why am I involved? Any program that uses humor to encourage diabetes education and empowerment is something I want to be part of. On a personal note: Diabetes or not, there was a time when, yours truly, worked at a Dentist�s office. Without getting into the details, I saw things there that scared me and made me want to take care of my teeth and gums. 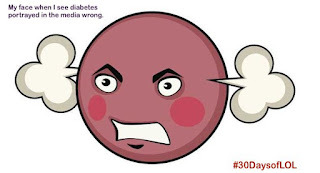 On a professional note: When I saw that fellow Diabetes Advocates including the American Diabetes Association (@amdiabetesassn,) mySugr (@mysugr,) Divabetic (@MrDivabetic,) and Sofrito For Your Soul ( @urbanjibaro,)were involved, I immediately agreed to join in the �30 Days of Laughter,� campaign. And from the bottom of my busted pancreas and regardless of your diabetes type, I sincerely hope you�ll join in #30DaysofLOL, too. For more information on the campaign, here�s the link to the �30 Days of Laughter,� press release.